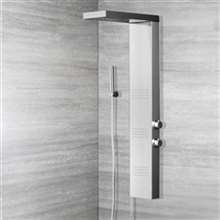 The Piero Rainfall Shower Panel System provides 57" of showering pleasure. Rainfall showerhead and six body massage jets ensure maximum relaxation. Handheld shower provides additional coverage when needed. This beautiful stainless steel shower panel system will transform your everyday shower. 1.2 GPM Delivered per body spray under 45 PSI . Efficient massage and low water consumption. Allows you to receive a massage while you take a ��traditional shower." Swivel shower head allows you to adjust the spray to the desired part of your body. Delivers 2.5 GMP max under and water pressure. Equipped with a state of the art anti clogging system. Manufactured from high quality brass flex-hose. Long enough to go anywhere in the shower. Chrome Finish for an elegant look. Exceptional durability for a longer life. Engineered with custom materials that reduce clogging. 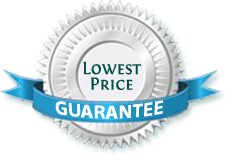 Engineered from high quality products that will hold up to the maximum water pressure. Easy Installation "Easy to Install"
Panel mounts in less than 15 minutes with usual tools. Nothing to recess (avoids most risk of water damage). Fast and convenient access for easy maintenance. Adjustable jet nozzles for water massage. Unique massage panel is designed for a flat wall. Shower panels system comes with a rain shower head, a brass handheld showerhead, and massage jets. Easy installation and comes with all standard accessories. Getting a full shower set for the price i got this one is deserving of 5 stars. Moreso is the fact that the shower panel is really incredible. From the finish to the functionality, it a really top quality product. I totally recommend. There were a couple of things about this shower which encourage me to buy it. First is the price. It was on sale when I got it so I was able to save about $500 on this purchase. Just imagine how happy I was! Then there are the features, all of which were present and working splendidly. Lastly, the customer service rep is to be commented. He was very helpful and pleasant. I would definitely recommend this shower panel and this company to anyone. Would gave it a 5 star for it quality and appearance, but got no installation instructions. This is definitely something that I would recommendâ€”there's just so many reasons to do so! For one, this shower panel really works well. All the features and components worked excellently. The design also looks good to me, though I guess that would be a matter of personal taste. But the best reason I can give is the price. I still can't believe I got a full shower set system for less than $500! I had one of these installed a couple of weeks back and man, is it nice. This is the first time I've ever bought one or had one for that matter and so far I'm liking it. Not only does it look great and adds a more modern appeal to my bathroom, but everything works flawlessly as well. I was looking at the other shower panels on the lower end of the price range, but I strongly feel that this is worth every dollar.